Repairs PVC, ABS, gutters, seals electrical wires, plastic bumpers, battery cases, fish boxes, sprinkler heads, on board fuel tank leaks, and many automotive and household uses. Bonds to rigid and / or semi flexible surfaces, TechPlastic is permanent and can be molded to any shape. 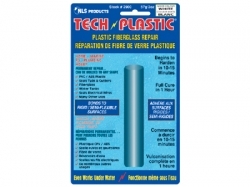 Use TechPlastic plastic fibreglass repair for home, marine, RV, plumbing and hobbies. Even works under water! Plastic fibreglass repair for use in home, marine, RV, plumbing and hobbies. 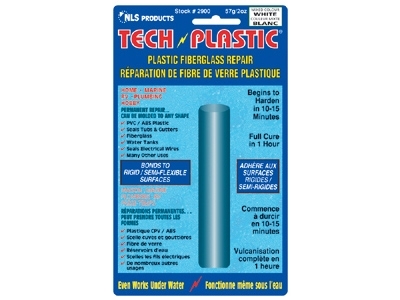 TechPlastic is distributed in Canada by NLS Products.